20 minutes on the Shin-Wakaura-bound Wakayama bus, then walking for one minute after getting off at Gongenmae. 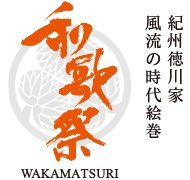 As part of the Wakamatsuri event, during time period 1 below, the Daidocho and Gongenmae stops will not be used by buses (bound for Nankai Wakayamashi Station/JR Wakayama Station), and during time period 2 below, all bus stops from Wakaura – Furobashi – Gongenmae will be diverted due to the road being closed because of traffic restrictions. Please be aware of this. Traffic restrictions are planned to go ahead. Please be aware that this may be subject to change. 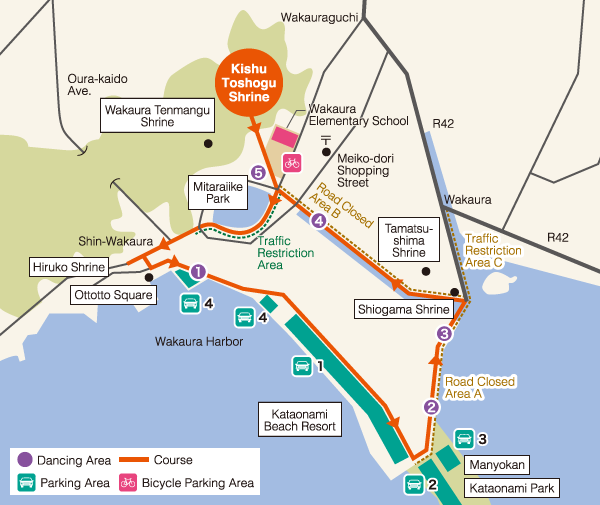 *However, it will be possible to leave for the Wakaura Intersection from 15:40 onwards. *However, it will be possible to leave for the Wakaura Intersection from 15:20 onwards. It may be difficult to leave from the following three parking areas: Kataonami Beach Resort Parking Area (P1), Kataonami Park Parking Area (P2), Manyokan-mae Parking Area (P3) Please be aware of this. Additionally, it may become difficult to leave from the vicinity of Wakaura Parking Area as the parade passes by.